Only showing entries about deloraine from Sustainable Travel. 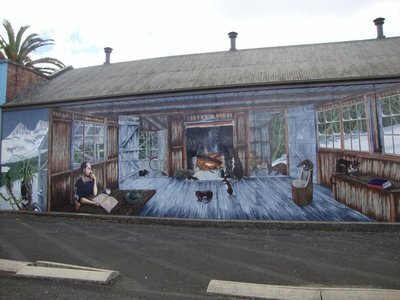 View entries about deloraine from all Travellerspoint blogs. 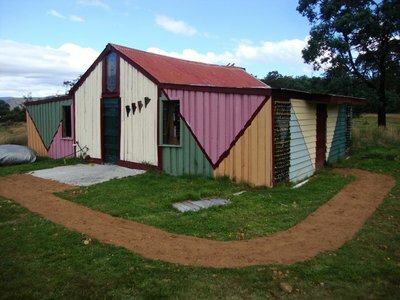 Until about 15 years ago, before an opportunist real estate agent made a documentary about Tasmania, this particular state of Australia was almost forgotten. When talked about, it was more commonly known as a joke. Nowadays mainlanders and your odd foreigner are buying up land like their life is depending on it. Granted, it is a good investment. It makes prices skyrocket and it’s no longer affordable for the average person with a serious interest in the country lifestyle. Cause that’s what Tassie is all about. It’s still a place where small villages rule and the local communities are going strong. Front doors do not need to be closed and neighbors help each other out without being asked. This could all be gone in the nearby future. Next we were heading more north up along the east coast towards the Bay of Fires. Critically acclaimed by Lonely Planet (I’d never heard of it. ), thus worth checking out in my book. Hitching to St. Helens was interesting. We almost got stuck in the middle of nowhere until a car stopped way ahead of us with screeching tires, putting himself in reverse and speeding backwards coming to a halt right in front of us. This is going to be interesting we though to ourselves. Turns out they were a lovely couple, providing us with a ride all the way up where we needed to be. After some much needed fish and chips in town, we got to know a kiwi couple living out their campervan. 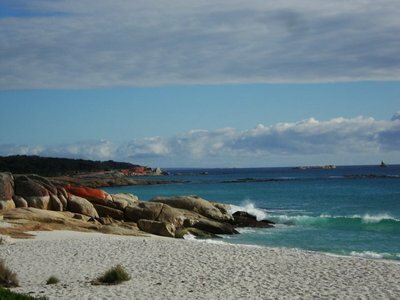 They took us up to the Bay of Fires and we camped in a pretty fantastic spot right next to the beach together. It’s exactly what we expected it to be. Endless perfect white sand beaches, red rocks and clear blue water all the way for miles and miles. Sometimes these HelpX hosts fall through and you are put in, what we thought at the time, a rather luxurious position. Extra free time to go scout the island. We reconnected with another host, who took us in last minute for a couple of days. Just because he could and wanted some extra company around. Andre has this little paradise tucked away in the middle of nowhere and we would have wanted to stick around for a lot longer, but as you can guess, there was still plenty to see in a limited amount of time, so we had to say our goodbyes way too early. Tassie seems to be a lot of firsts for me. Catching my first fish and shooting my first riffle! 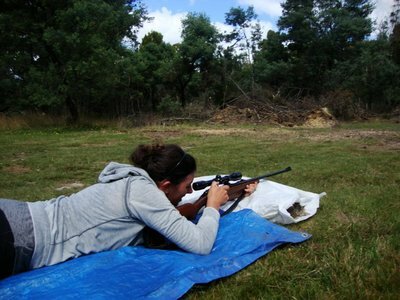 Target practice was awesome and a good skill to have in case the world goes apocalyptic on us and I’d have to survive by killing some scary zombies. 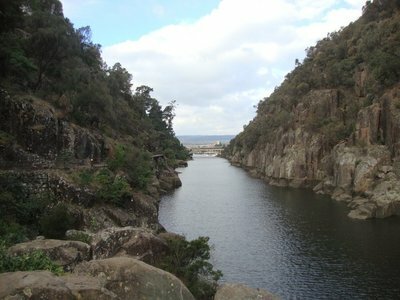 Next was Launceston (aka Launie by locals)! Nothing much to do or see there. Another big city, I mean oversized village, but this time on the northern part of the island. 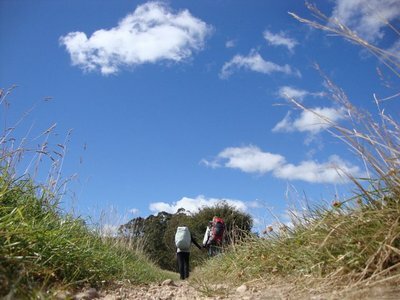 Some lovely couchsurfing and a visit to the gorge later and we were on our way to Deloraine. 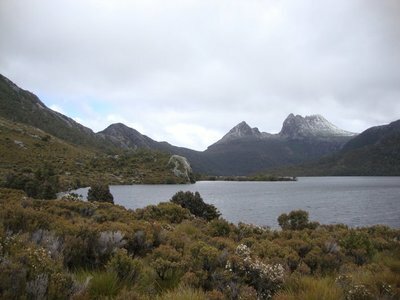 This was where we were going to base our visit to Cradle Mountain out of. We thought we were pretty lucky to have found these awesome hosts. They were tremendously accommodating and we owe much to Graeme and Geraldine. Without their help we wouldn’t have been able to experience how beautiful this region actually was. Not to mention their house! Perfect example of using recycled and readily available materials. Cradle Mountain was gorgeous, we saw our first wombats (alive and not as road kill, very important detail). An initial 20 minutes of blue skies was the start of our 3 day planned hike. Then trouble began to rise to the surface or rather come down on us. Icy winds, snow storms and pathways turning into rivers wasn’t exactly what we were prepared for. We do have some warm clothes in our backpacks but no mountaineering gear though. So after drying out all of our stuff in one of the shelters, we decided to cut the hike short and make our way down to the sunny valley of Sheffield, a town famous for its murals. We followed the Tasmanian trail (Devonport to Hobart, north to south, straight across) for a bit and camped out in a forest nearby town. And what a fabulous alternative that was. The pine trees very much reminded us of home. The distinctive Eucalyptus trees are basically the only vegetation we’ve been seeing here so far in Australia. 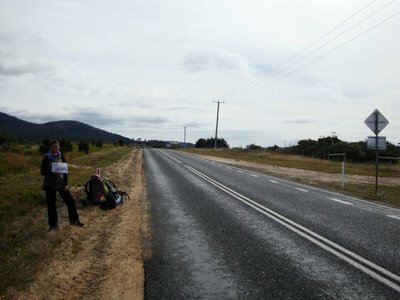 Hitchhiking is definitely more easy in Tassie because of the small island mentality. We thought it was never going to be as easy as Hawaii again (Where hitchhiking is a very common way and very much accepted to get around the island. 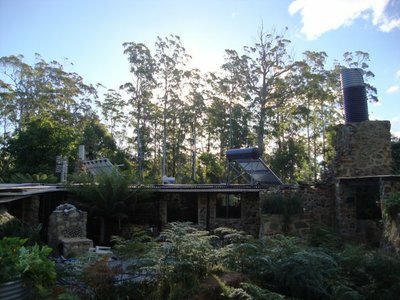 See previous blog entry The Big Island of Hawai'i), but Tasmania has proven to be the most helpful and trusting place. We stuck our thumps up once again and crossed the state in less than four hours making it all the way down to Woodbridge, to our last HelpX place. 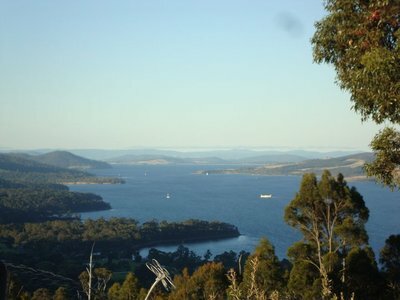 Another hidden little piece of paradise with a gorgeous view of the D’Entrecasteaux Channel and Bruny Island. Dagmar, our host made us feel at home instantly and I know, I didn’t really feel like leaving at all. 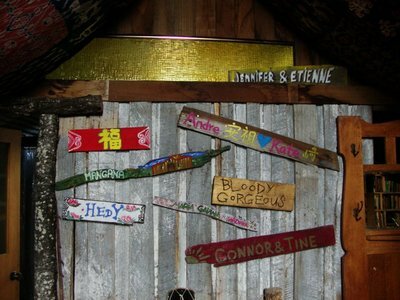 We meet many folks the way we are traveling and a lot of them we won’t remember, but once in a while there’s someone you will want to keep in contact with and maybe one day visit again. Dagmar is definitely one of those. We’ll miss her and her crazy nonetheless extremely lovable pups. Because we are traveling, there’s no time to get a dog ourselves any time soon. So it expresses itself into a lot of love for all these puppies we meet along the way. Bonnie especially, she kept us busy taking us along for her extensive swims. 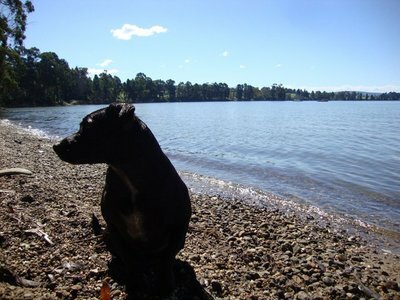 She could be a little neurotic but such a beautiful Stafford terrier. She definitely did a good job at keeping us entertained. 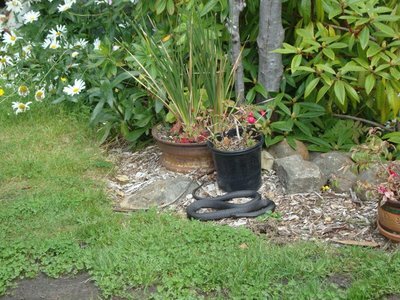 You had to watch out though or she would have taken off by herself and swam all the way to Bruny Island. 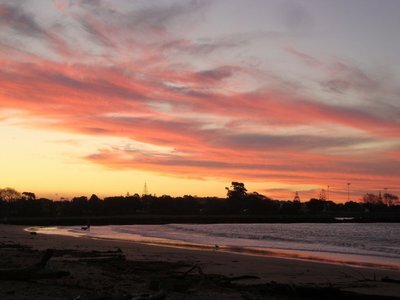 Our last night in Tassie was spent camping on the waterfront in Devonport, waiting to leave on the ferry the next morning back to the mainland. A beautiful sunset was our goodbye gift. So in conclusion, Tasmania is ranked high on my favorite places in the world list. It still has it all. Cozy little villages, beautiful beaches, mountains, an abundance of lakes and part of it, the west is still wild and uninhabited. But most of all, I liked the friendly islanders.